Glenn Maxwell gave no indication he was about to turn in one of his greatest digs. Since his return from Australian ODI duties against India, the Stars skipper had posted 5, 61, 3, 7, and even last night against the Sixers at the MCG he wasn’t in any destruction mode with 17 off 20. Until he clicked the let’s go switch. Combining discipline with destruction Maxwell faced the next 23 deliveries, putting on 54 in a stand with Seb Gotch who only faced a single ball. Maxwell started his onslaught in the 17th over by targeting offie Nathan Lyon, ripping 16 of him with 2, 6, 4, 2, 1, and 1, the second last single with Dwaye Bravo comically losing his bat, and his wicket, to be run out attempting a second run. Next cab off the rank was Sean Abbott with 15 that included 4, 4, 0, 0, 6 and 1, then the usually economical Tom Curran for another 15 with 6, 4, 2, 0, 2 and 1. Ben Dhawhuis bowled the 20th over with Maxwell depositing the first two deliveries deep into the stand, and a single giving Gotch his first strike which was another single, before making it 19 off the over with another massive six. Maxwell had gone from a sedate 17 off 20 to a master-blasting 65 off the next 23, to lead the Stars from an ordinary 4-101 at the completion of the 16th over to a very competitive 168. And in the process he big bashed the Sixers out of a home semi-final, with a humiliating 94-run defeat that saw the Stars leap-frog the Heat into the final four. The Sixers didn’t have to win, all they had to do was total 107 to clinch the home semi, but they were bundled out for a record low franchise score of 74 by an attack that had been smashed all over the Gabba just two days before by Heat openers Ben Cutting, and 19-year-old Max Bryant, to the tune of 0-158 off just 10 overs. What a spectacular turnaround by both Maxwell, and his attack, in just 48 hours. Daniel Worrall – 0-22 off 2 and 2-24 off 3. Jackson Bird – 0-16 off 1 and 1-15 off 2. Adam Zampa – 0-31 off 2 and 2-15 off 4. Glenn Maxwell – 0-22 off 1 and 1-6 off 1. And Sundeep Lamichane – 0-28 off 2 and 3-11 off 3.4. Marcus Stoinis took 0-24 off 1 in the Gabba mayhem, as was Dwayne Bravo’s 0-15 off 1, but neither was called on last night. 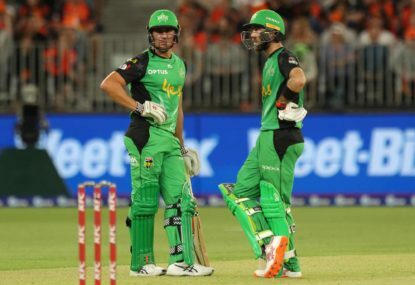 So the Stars take on the Big Bash leading Hurricanes at Bellerive in what will be a mouth-watering clash between the locals Matt Wade and D’Arcy Short, the tournament’s leading run-getters, with the explosive pair of Stoinis and Maxwell. 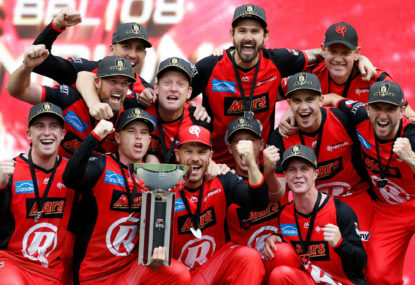 That leaves the battered Sixers to try and put last night behind them in Melbourne against the Renegades in the other semi. Don’t be at all surprised if the decider is an all-Melbourne affair. Melbourne Stars all-rounder Marcus Stoinis has dominated the Melbourne Renegades this season and will be key to his side’s BBL title push.